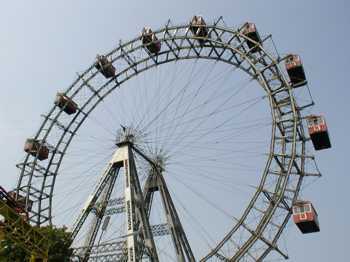 A journey on the giant ferris wheel in Vienna, Austria is an unforgettable experience. It was built over a hundred years ago and has been updated on several occasions. During World War Two it was almost completely destroyed. The Viennese call the wheel the 'Riesenrad' and hold it in such esteem that it was one of the first structures/buildings to be rebuilt after its destruction during the war. Currently the wheel has over 750 000 visitors a year. The famous silhouette of the wheel can be seen from most parts of the city and it has become a trade mark representing Vienna. The wheel was originally constructed by a British engineer called Walter Basset. The overall weight of the steel structure is 430 tonnes and it stands to a height of 34.20 metres. 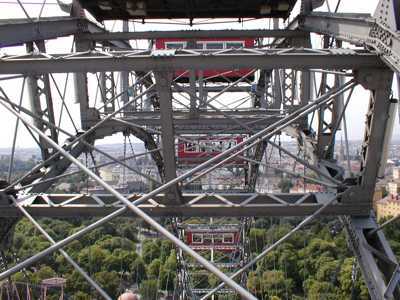 The diameter of the wheel is 60.96 metres. 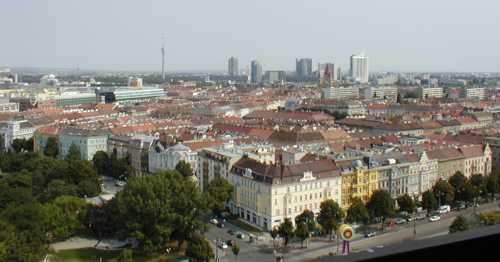 From the top, the wheel gives an excellent view of Vienna (photograph below). At night the modern lighting effects and search lights create an excellent atmosphere. Each hour the giant wheel represents a giant clock of light. The lighting effects were created by the British light artist Patrick Woodroffe. The photograph below has been taken from a carriage as it reaches the top. 1. Explain the method of fixing that is used to hold all the steel parts together. You may wish to draw a diagram(s) to help explain your answer. 3. The photograph shows excellent examples of triangulation. Why has triangulation been used?